I have just added a link (to the left of this column) to my post on Film Journal International's "Screener Blog." It is an interview with Italian human rights filmmaker Gianfranco Rosi (El Sicario, Room 164). His documentary, Fire at Sea, won the Golden Bear at Berlinale earlier this year; it is about Lampedusa's role in the rescue of refugees arriving by boat from Libya. Fire at Sea, which screened at the New York Film Festival today, is Italy's entry for the Academy Awards. 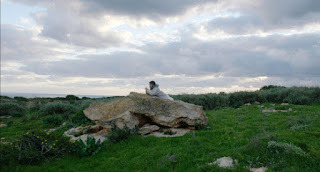 Rosi's film follows several of Lampedusa's denizens, including an adolescent boy, Samuele (pictured above) and Dr. Pietro Bartolo, the Sicilian island's sole physician.